Model Jessica Gomes appeared in the Swimsuit Issue of Sports Illustrated every year from 2008 to 2015. She also appeared with Bruce Willis in the recent action comedy film Once Upon a Time in Venice and alongside Owen Wilson in the movie Bastards, set to open late this year. 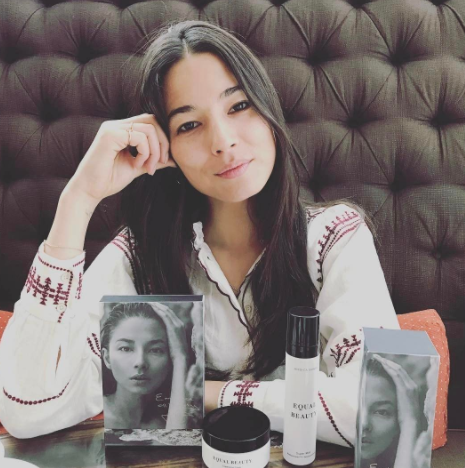 The David Jones ambassador has also recently launched her own beauty brand, Equal Beauty. Gomes, 32, chats to me about how she stays in shape, what she likes to indulge in, and the best advice her actor boyfriend Xavier Samuel has given her. [I’m] back for the David Jones spring/summer launch, which is really exciting; just came back to shoot the new Jets campaign, which is amazing; working on Equal Beauty – we launched four months ago; still auditioning and doing the film side of things. What are some of the spring/summer trends we should expect to see. Do you have a favourite fashion piece for spring/summer? There’s so much to choose from. I would say one of my favourite pieces would be a lace dress from Self-Portrait, or a dress from Ginger & Smart. I always think it’s nice to have a printed dress or a bright colour for your wardrobe. What does being the face for Jets involve? I came on with them just recently, so we just launched the first campaign, and we just shot the second … I’ve always been shot in their swimwear, and I always wear Jets in the [David Jones] show as well, so it’s a nice affiliation … [I’m] definitely in with them for longevity, and we’re going to be doing some exciting collaborations in the future. As a swimwear model, how do you stay fit? I do lots of things. Right now I’m really into yoga, and I’ve been doing a lot of yin classes … I feel the best when my mind’s feeling good, like mentally I’m feeling sharp, and clear, and great. For me, lately, I’ve been doing a lot of meditation and yoga, and doing lots of long walks; nothing too aggressive. I love food, I really do. I definitely try and keep it 80 per cent pretty lean, but I’m not too strict on myself. As I get older I’m just like, “You know what, babe? Life’s too short. You deserve whatever it is as long as it comes from a good place.” I’m very much into shopping at farmers’ markets, and eating organic as much as I can, especially in LA … I get my vitamin drips. I do my smoothies. I do my green juice everyday … I have to have my coffee, but I’ll indulge in a really good bowl of pasta, some really good food, especially when I come home … I’m definitely a little more lenient in terms of what I like to eat. Is modelling or acting your No. 1 focus? Definitely modelling is still my No. 1. It’s what I do well … I think acting is more a hobby, something that I have there because I really love being creative and telling stories and working on film sets, but modelling has always been my core, and it will always will be what I do. Tell me about your coming film Bastards. Bastards is a film with Owen Wilson, Glenn Close and Ed Helms. It’s about two brothers who are on the hunt for their biological father. I shot it two years ago; it just hasn’t come out yet … The studios have been waiting for a right time for it to come out, but it’s a comedy film. It’s really funny; I’ve seen it. What’s life like in LA? LA’s amazing, I love it. I just feel so comfortable there. I’ve got my house there, and I’ve got all my things, and I love the lifestyle. I’ve got such a great group of friends there, and I just love it. It’s central to everything. I still duck off to New York if I need to, or it’s one flight over to Australia, or one flight to Europe. I get to dip into the film industry and then dip into the fashion industry too. Will you ever move back to Australia? I feel like Australia will always be a place that I come back to. Obviously it’s where I’m from so I feel like my roots are here, but I do feel rooted, also, in LA. I feel like I’ll always do both … I definitely would move back here in the future when I have a family. What inspired you to go into the beauty business? I love beauty, and I’ve always been obsessed with cosmetics and beauty products, and I spent a lot of time in Asia, and in Seoul, and in South Korea. I discovered so many amazing beauty cosmetics … I thought it would be amazing to start my own brand, and be able to use the David Jones platform as well, as a way to launch it … I wanted something that I could travel with, that was the whole inspiration. I need an easy routine that I can travel with around the world, for hydration and protection, and fragrance free. I wanted it all natural but still effective, and still medicinal, still a preventative, because I was finding that other products weren’t working for me. What were the biggest challenges of starting your own business? The biggest challenges would probably be being resourceful. I think becoming a business person, and becoming an entrepreneur, you realise that it’s just problem solving the whole time … Putting out fires, problem solving, making sure that you’ve got the right team. You’re constantly running into certain things and … you’ve just got to push through. But then the rewarding side of it is seeing the creativity come to life. I look up to my sisters because they work so hard and run a household. They’ve got three kids each, and I just see how hard they work and how dedicated they are to their family, and they do it all. Did you ever think when you were younger that you would have the successes that you do today? I did not think that I would ever be in the position that I’m in now. When I first started out my career in Australia … it wasn’t really happening for me, so I had to go overseas, but David Jones has changed my life … and I’ll be forever grateful for that … I’m just proud that I’ve been able to stay grounded and still be true to who I am, and still keep my integrity with everything that I’ve been doing. How’s everything going with Xavier? Everything’s going great. He’s amazing. We’re doing really well. He’s just been in LA with me. It’s been wonderful, because he’s obviously in the film industry as well, so we’re really, really good. Is he a big support to you? He is, he’s very supportive. He’s been really amazing throughout everything, and just been so great, and I feel really lucky that we’re very supportive of each other’s careers, and we definitely let each other do our things. Do you find it easier to date someone in the industry, or do you find it more challenging? It’s important to let one another be your own person and … that you both can have your identity, and both do your own thing, but still have that support and come together, so that’s been really nice … He helps me with auditions. We read lines together. What’s the best piece of acting advice he’s given you? What do you guys do when you have time off together? I am heading to Asia. I’m going to Singapore, Seoul and Shanghai for Equal Beauty. We’re going to do some research there, and we’re setting up to launch over in Asia, and then I’m back [in Australia] for a Dior event with David Jones. WE WENT TO The Restaurant at the David Jones Food Hall, Bondi Junction. WE ATE Oysters – Raw, Kilpatrick and Mornay; Market prawns with parsley, garlic and extra virgin olive oil; Shredded raw vegetables with Sriracha vinaigrette and pecorino; Grain Fed Wagyu Beef. WE DRANK Mineral water and herbal tea.